The “Biodiversity Action Day” in Tam Dao National Park invited visitors to gain a personal experience of nature and “wilderness”. The 24 hour program of events was organized around “Biodiversity Stations” in and around the National Park. These Biodiversity Stations, some of which remain a permanent feature of the National Park, were designed to provide visitors with an insight into the natural diversity of the area. During the Action Day visitors explored nature with the help of scientists and local guides and shared their findings and experiences. A series of cultural and artistic performances also accompanied the events. 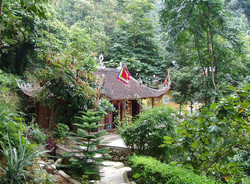 Visitors could thus enjoy a unique situation of joint learning and enriched experiences in the middle of nature.